My Armchair Whisky Pleasure Cruise – Part One. I am currently six months into my year-long quest to learn to like whisky and it’s going pretty well. In fact, I think I am ready to graduate to a new level. 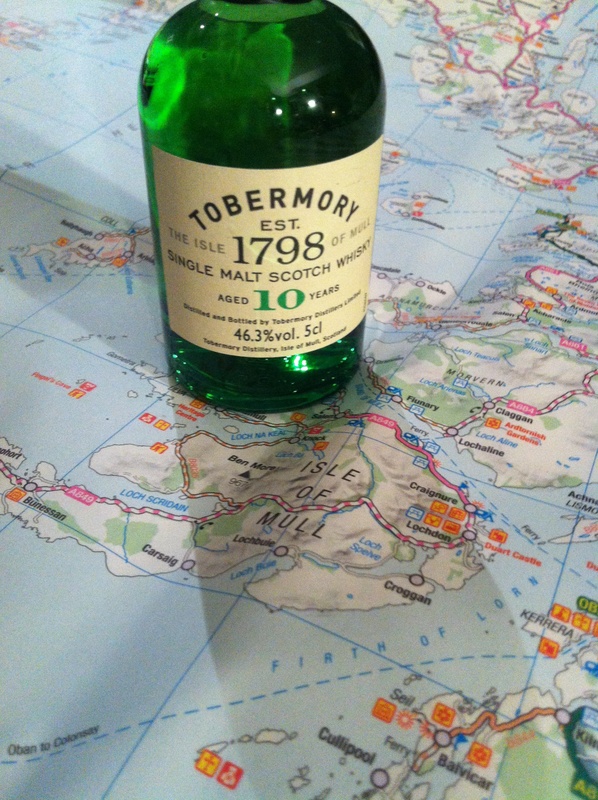 The big peaty island whiskies – those from Islay, Jura, Skye – were always going to be the hardest to reach. You know, the ones which to non-whisky lovers taste as pleasant as a glass of Dettol and make them think they will never develop a taste for the drink. But the ones that to some whisky worshippers are the only type of whisky that really matters. Well, I’ve deliberately left these whiskies until later in the game. I knew that, as a virgin of the malt, I wasn’t ready for them. The time to hang out with the wild island lads would be when I was mingling well with their milder mainland cousins. So I went off tried to do just that: I started socialising with some mainland whiskies. I visited distilleries, I found bottles in overseas supermarkets, I ordered from Tesco online based on delicious sounding descriptions. And, after six months, I can now count the following among my whisky collection. Yes, we live together and it’s going well. And what these whiskies all have in common is that they were cited as smelling and tasting of things I already liked. Edradour, they said, tasted of sherry and vanilla. Cardhu was bursting with flavours of smoke, apple peels and bruised pears. 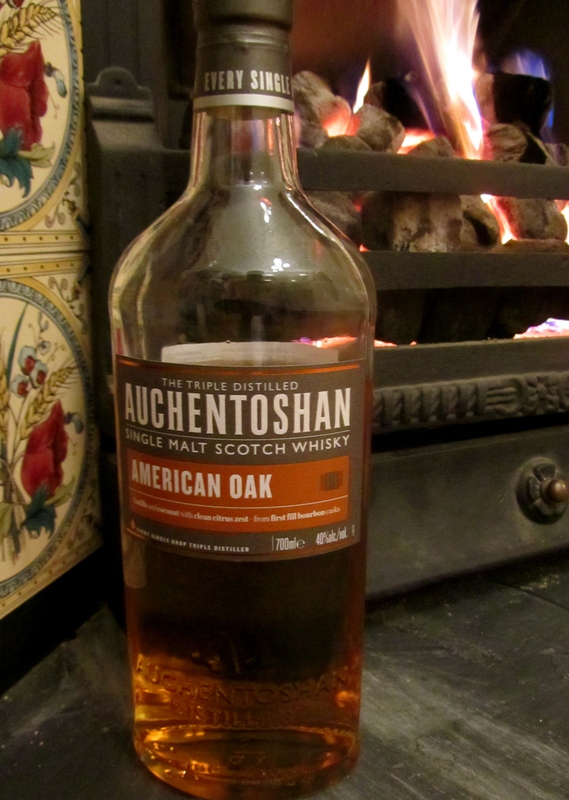 And Auchentoshan American Oak beckoned me with promises of coconut; zesty fruit; vanilla cream; white peach and sugared grapefruit. How could I resist? But I am now ready to take things up a notch; move out of the comfort zone again. And I was thinking that a nice way to do this might be to visit some island distilleries. You know, catch a ferry and have a dram or two in each port: seagulls cawing in my ear, salty wind in my hair, my face scratchy pink from the cold. The only thing is, because it’s the middle of winter, ferry crossings can be pretty precarious. And I’m not feeling so wealthy after Christmas. So, I’ve decided, instead, to do an armchair cruise: a journey that will only necessitate leaving the house to buy a few whisky miniatures. But once back home, with dram in hand, if I open all the windows and let the Scottish weather in it will feel like I’m on a remote, wind-blown island anyway. 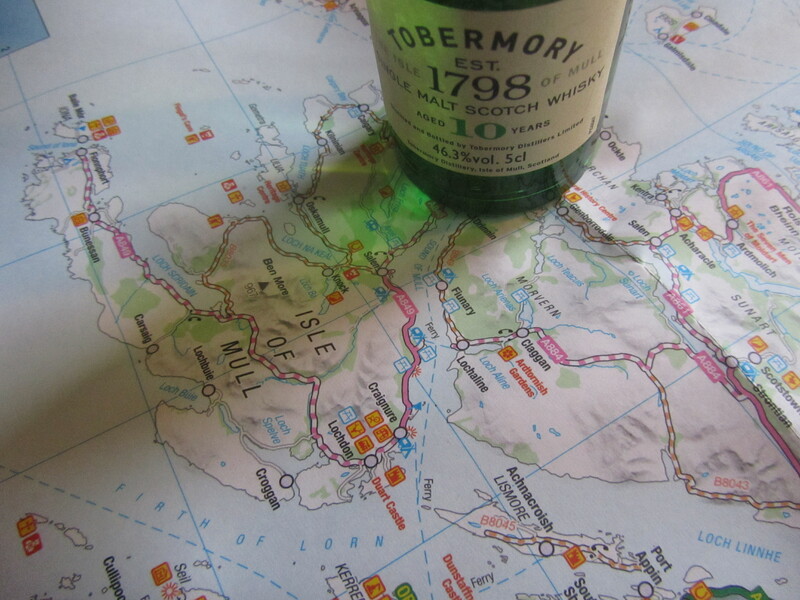 So, the first port on my living room island cruise is Tobermory, on Mull, and the whisky is a Tobermory 10 year old. This is a lightly peated whisky – a good starting point, I think. It’s not so much cheating as warming up. So, with the fire flickering and Des O’Connor on the turntable*, I pour myself a glass, and one for Mr. Malt, too. “How would you describe the colour?” I ask him. He decides that it’s golden. I agree, then sniff away and try to identify what’s on the nose. Together we come up with it’s lemony, citrusy fresh and has a whiff of sea air. Or maybe it’s more him that comes up with it, but I’m providing the whisky so he can’t complain. I have a wee peek at Michael Jackson’s Whisky Companion to see what the master thought. The nose is described as “fresh and nutty” with “citrus fruit and brittle toffee.” “A whiff of peat” is also noted. We move onto the drinking. Mr. M says that he thinks the palate is full bodied, peppery and peaty. I think it’s soft and lovely and tastes of toffee clouds (I figure I’m allowed at least one made up thing in my tasting notes) lemon, nectarines and peach juice. And as I sniff again, I wonder if there isn’t perhaps a hint of Murray Mints on the nose. MJ’s companion describes the palate as “quite dry with delicate peat, malt and nuts.” So, we don’t seem to have been too far off the mark. The after taste of this whisky lingers quite a while. It reminds me of that toothpaste advert where it keeps on working long after you’ve finished brushing your teeth. It tastes nicer than toothpaste though. My memory is now jogged to something I read about whisky toothpaste. A quick Google search confirms my recollections You can even make your own. But this is probably a far tastier option. I am conscious that the whisky still burns when I swallow. I wonder if this element never quite goes away but is what whisky lovers actually enjoy and see as an integral part of the experience. The warming after-glow certainly is. I try to be clever and swill the whisky round in my mouth to see what other flavours I can get but all that happens is that it catches in my throat and burns the inside of my ears. A novel experience at least. 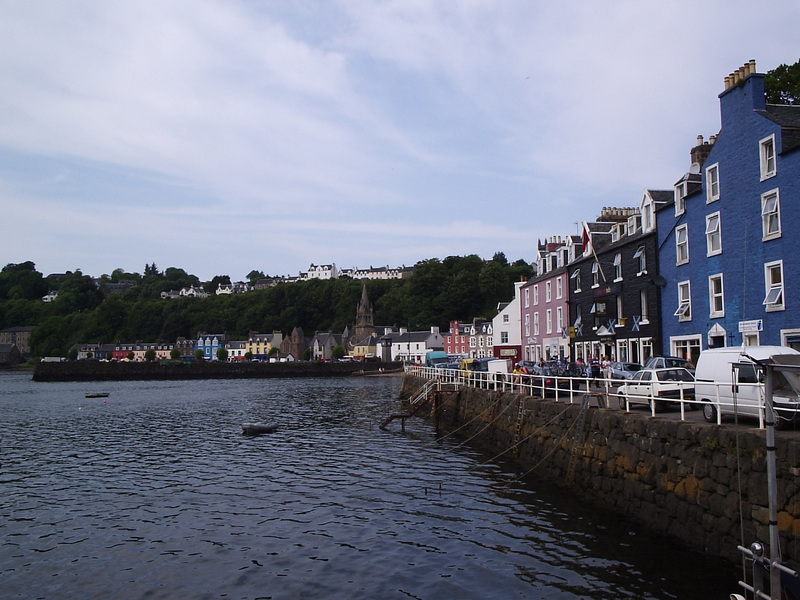 So, in all, my appraisal of Tobermory is that it’s like clambering through a bog, eating Murray Mints and chomping on a peach. And the after-party in the mouth is a rather lively affair. The sort of whisky you could buy a beginner, I think. A category I still fall into, so maybe I will purchase a bottle for myself when I’m back on the mainland. * actual music may have varied. I begun reading this article with the thought: gee that’s a big map! It made much more sense when you mentioned miniature bottles! Anyway, good luck with the foray into peated whiskies. I hope, however, that you’ll make it over to Islay someday for a visit. It is truly my absolute favourite place I have ever been!